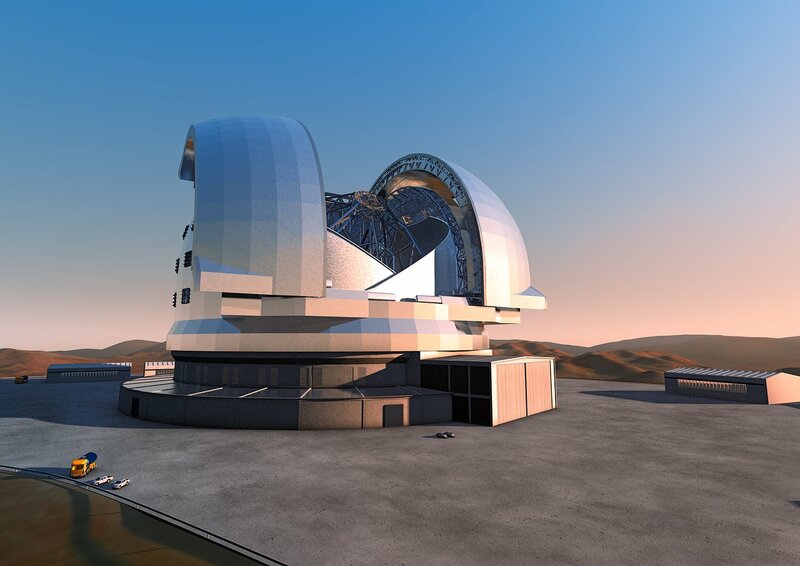 With a decision by ESO Council to endorse a revised baseline design for the E-ELT, ESO is one step closer to starting construction of the European Extremely Large Telescope (E-ELT) on 3060-metre-high Cerro Armazones near ESO’s Very Large Telescope site in Chile. After the successful E-ELT Design Review in September 2010 and with Brazil joining ESO (eso1050), the E-ELT project is now not only technically ready to enter the construction phase, but is also backed by a solid funding scenario. Between the end of 2010 and the summer 2011, the E-ELT project extended the detailed design phase in order to consider the recommendations of the E-ELT Design Review. The main goals were the reduction of risk by optimising the cost and constraining the schedule to make sure that ESO can further expand its leading role in astronomy by constructing the world’s first extremely large telescope. In June 2011, the ESO Council endorsed a revised baseline design for the E-ELT and now expects a construction proposal for approval in December 2011. A decision on the additional funding needed from the ESO Member States will be made at the same time  — an additional contribution of €250 Million in total and a 2% year-on-year increase of the annual contributions on top of the normal indexation over a decade. Several Member States are already in the process of committing to their part of the E-ELT funding (see ann11030). The start of the E-ELT construction is planned for January 2012, which will enable the E-ELT to start operations as an integrated part of the Paranal Observatory early in the next decade. The overall concept of the 40-metre-class telescope remains unchanged. A slight reduction of the diameter of the primary mirror to 39.3 metres combined with a faster f-ratio, allows a more compact dome and main structure. This leads to a significant cost saving, as well as reduced risk on major items such as the secondary mirror. The estimated savings reduce the total project cost (including instrumentation and a healthy contingency) from €1275 to €1050 million. The costs are stated in 2011 euros and are subject to a review in Autumn 2011. Even with the slight decrease in size the E-ELT will gather 15 times more light than the largest optical telescopes existing today. “As much as we astronomers always aim for ever bigger telescopes, the core purpose of such a revolutionary project as the E-ELT is to find the right balance between scientific capability and cost efficiency. ESO has always managed to lead ground-based astronomy and built front-line telescopes thanks to this approach” says Tim de Zeeuw, ESO’s Director General. “With the new E-ELT design we can still satisfy the bold science goals and also ensure that the construction can be completed in only 10-11 years. This will allow the E-ELT to operate simultaneously with the James Webb Space Telescope”, he adds. The budget of the instrumentation suite remains unchanged and the optimisation of the design leads to a decrease in resolution no bigger than 9%, which does not significantly affect the E-ELT’s revolutionary scientific ability. With a novel five-mirror design and integrated adaptive optics, the E-ELT will become the leading facility in many areas of astronomy. These include the quest to study and image exoplanets, including the analysis of their atmospheres, down to Earth-like masses. Brazil is exempt from the additional Member State contribution, as stipulated in the accession agreement.